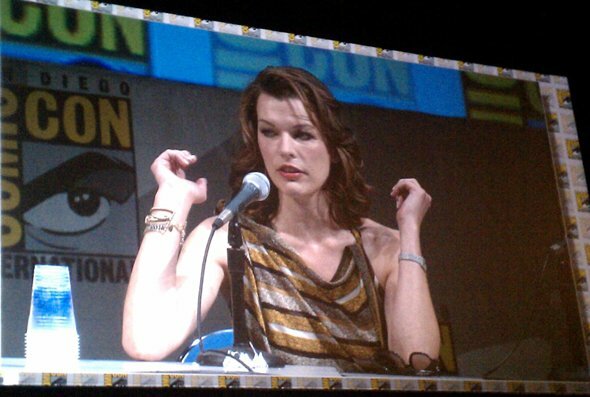 Come September, Milla Jovovich will reprise her role as Alice in the fourth film in the Resident Evil franchise. The longest series in the history of video game adaptation, the stars and crew are here in San Diego to show us some footage and answer some questions. And guess what? I’m here to live blog it! 4:06 Kicking it off with a trailer we've already seen, only this time it's in 3D. Arriving on stage are director/writer/producer Paul W.S. Anderson, Wentworth Miller, Ali Larter and Milla Jovovich. Despite the fact that this was one of those rare movies to actually be filmed in 3D, the whole video was almost entirely clear without the glasses. No depth=why made 3D? 4:10 Anderson says he has always been a fan of 3D, but it was Avatar that showed him that the technology was ready. 4:11 The exact same creative team and cast has worked on all four films in the franchise. 4:13 Larter says that Milla and Anderson are the heart of the franchise that properly treat the franchise with the perfect amount of passion. 4:17 The movie was shot in 3D and changed the way that Anderson shot, set up and edited the film. He believes it will be the same type of shift as color and sound. 4:18 Footage of the fight between Ali, Milla and The Executioner from the Resident Evil 5 videogame. I don't know if it is because of the prop or the 3D, but his axe looked like plastic. 4:24 Milla accidentally shot out one of the cameras on set with a gun. Good use of $100,000. 4:27 Just as implied at the end of the third film, there will be an army of Alices in this new film. 4:28 The film was shot all over the world and has the higher budget than any other in the franchise. 4:32 Sorry, fans: Leon will not be in this film. 4:34 A fan just got Milla to say "Multipass" like Leeloo from The Fifth Element. Awesome. 4:39 Most of the action scenes in this film were done on green screen, though not all of them. 4:41 Larter just called The Phantom camera (aka the one Cameron used for Avatar) "the diva of the set" because of its inability to function in hot or cold temperatures. 4:43 That's all for this one. Check back in a few for the next round of live blogging!